Flight director deems "dings" on shuttle wing "very minor"
(CNN) -- The space shuttle Atlantis crew completed its first spacewalk to upgrade the Hubble Space Telescope, a daylong act of grueling labor that featured the replacement and installation of key instruments. Spacewalkers remove a camera from the Hubble on Thursday. Astronauts John Grunsfeld and Drew Feustel removed the Wide Field and Planetary Camera 2 and swapped it out with an updated model, a device that "will allow the telescope to take large-scale, clear and detailed photos over a wide range of colors," NASA said. But they had a tough time removing a bolt in that task, an issue that caused some concern for colleagues on the ground. They eventually released it. "OK, here we go. I think I got it. It turned. It turned. And it's turning easily now," Feustel said. "Very nice." In all, the repair mission took seven hours and 20 minutes, a hard day's work that ended at 4:12 p.m. EDT. "It turned out very well," lead flight director Tony Ceccacci said during a NASA briefing. 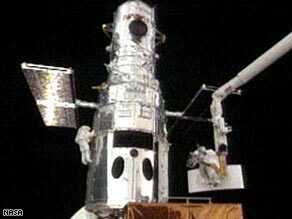 The team also replaced a Science Instrument Command and Data Handling Unit, a computer that "sends commands to Hubble's science instruments and formats science data for transmission to the ground," NASA said. The team "installed a soft capture mechanism, a device that will allow future vehicles to attach to the telescope," NASA said. And they installed "a combination of locks and latches that will allow for faster opening and closing of the telescope doors during the third spacewalk." "This is a huge accomplishment," Preston Burch, Hubble Space Telescope program manager, said during a briefing. "Our first EVA day in more than seven years." EVA is the acronym for "extravehicular activity," the phrase for spacewalking. It was the first of five spacewalks scheduled during the 11-day mission in which the crew will work in the shuttle's cargo bay to upgrade and repair Hubble. It's been seven years since the last space shuttle crew worked on the telescope, which has been latched to a rotating, "lazy Susan"-type device for five days of repairs and remodeling. A camera mounted on the shuttle's robotic arm, 200 feet from the telescope, is taking pictures of it -- the first time the telescope has been seen since March 2002. NASA canceled an Atlantis mission to extend Hubble's operational life in January 2004 because the trip was considered too risky in the wake of the 2003 space shuttle Columbia disaster, which killed seven astronauts. Hubble's "greatest discoveries," NASA says, include determining the age of the universe -- 13.7 billion years, discovering that "virtually all major galaxies have black holes at their center," and "providing evidence that the speed at which the universe is expanding is accelerating -- caused by an unknown force that makes up for more than 75 percent of the universe."